Julia’s cure continues to transform Barnabas, who can now operate during the day. His confidence grows as his romance with Victoria deepens. An openly jealous Julia begins tampering with the formula, causing Barnabas to revert to a savage form of his vampiric condition. 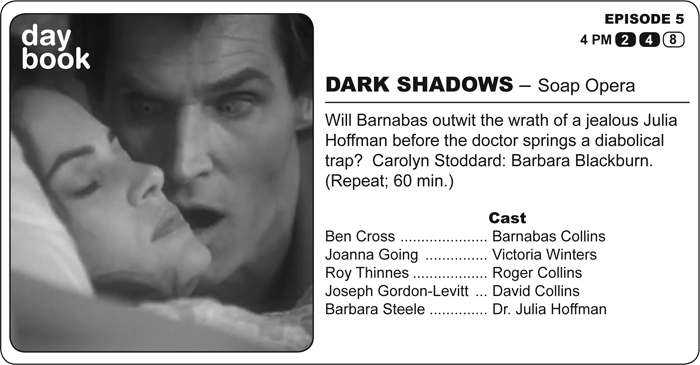 Barnabas demands that she administer a dose strong enough to cure him forever. Instead, she uses an altered version that causes him to age hideously. Carolyn stumbles upon him, and he attacks her. The result? He returns to his former youth, has Carolyn as a blood doll, and swears enmity to Julia Hoffman. With the exception of an endless date between Joe and Carolyn, this is an ideal episode to use as a series introduction. You can pick up 99% of the backstory from context, and it thrusts you into the action with one engaging scene after another. Writer Matthew Hall delivers vampiric peril, arch jealousy, and fairy-tale-if-fated romance. While those elements are in ample supply, what really keeps the installment going is its humor. Barnabas employs gentle wit in his occasionally playful seduction of Victoria, and Hall uses it with kindness and sympathy when exploring Jim Fyfe’s tragicomically affectionate take on Willie Loomis. It’s writing that can only come from growing up so closely to the series that you know each beat and why they matter. Once you see those intimately and intuitively, an appropriately ironic voice emerges. Speaking of Jim Fyfe, I congratulate him again. Along with the writing staff, the choices they make with Willie set up the rest of the characters beautifully. Barnabas is the ultimate “cool kid,” and it’s clear why the awkward and drunken misfit, Willie, is drawn to him. In turn, we see a kindness in Barnabas that is alternately sincere and guardedly manipulative. Finally, it allows us to like this universe a little more when Julia turns on Barnabas and Willie is caught in the middle. If both Willie and Julia are out to get him, we are stuck in a world that’s a tad too cold and which lacks the interpersonal dedication of the original… once it found its most sustained voice. This episode had an estimated thirteen million viewers with over one out of every ten TV sets in the nation tuned in to watch. It was only eleven days since the series premiered, and the Gulf War was kind to this episode with no recorded preemptions. It was about a month away from the cease fire.